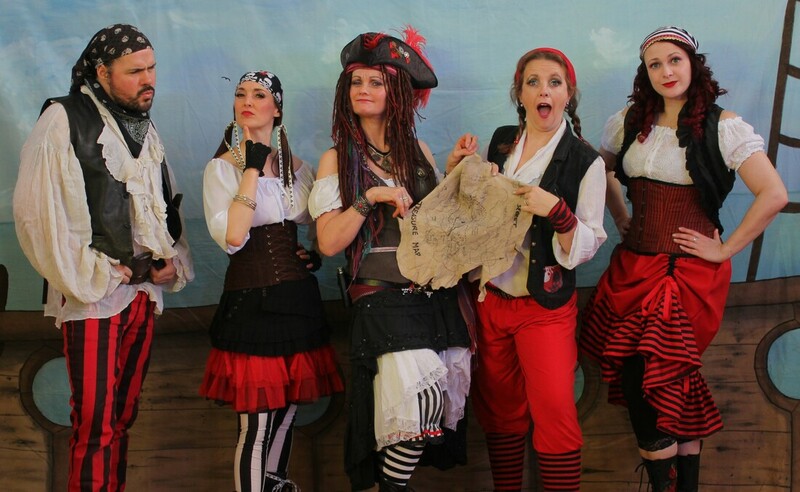 The Raggle Taggle pirates...we sure do live for an adventure, roaming free... Pirates are we! Join Imajica Theatre Company for a treasure searching adventure with Capt'n Mc Stinky and her motley crew of Raggle Taggle Pirates. These pirates live for adventure but things don’t always go to plan. Filled with drama, dance, and songs this interactive original production is suitable for the whole family, and created with the younger audience in mind. Sing -along with us, learn to dance the Sailors Hornpipe dance, listen to the tale of old Sea legs Sam and help us folow Capt'n Mc Stinky's Map to find the buried treasure. This 45 minute production is filled with interaction which has audiences calling out, singing along and joining in... Learn everything you need to know to be a pirate. Stow the anchor, hoist the sails as we set sail in search of hidden treasure! Imajica Theatre Companies touring production of Land Ahoy! -A Pirates Life for me!' can be performed anywhere, all that we need is access to electricity. We can provide a show tent for outdoor performances and can adapt out set for any space. Our shows can consist of 4 to 6 actors to allow us to offer a performance to suit your budget and we are self-contained, so set up, organize our audience and clear away independently. We provide a set and bring along our own PA system and sound tech but can also perform on a stage and work with a stage crew provided by you. A workshop includes games such as Port & Starboard- a drama game to build characterisation. Pirates Statues - musical statues, The Sailors Hornpipe - learn pirate choreography and I want to be a Pirate- A Sing-a-long game with actions too - 'Land Ahoy! - An interactive and imaginative drama game with songs and dance.